There's been a week of activity & progress on the house since my last post and with it has come a real sense that I might soon be living in a place that is finished, at least in the sense of physical building work. Amazing! Not only that but a whole new aspect of the house has been revealed, but we'll get to that in time. My desk setup in the office. The first change was one of my own devising, a very late Christmas present to myself. Last year I'd been seconded to an important client at my work and as the project was considered 'business critical' I'd been offered a large bonus on completion. The money had finally come through and I'd decided to treat myself to a new laptop with a nice big monitor to plug it in to. The screen was very satisfying on two counts, firstly it was very high quality which made it nice to use - as someone who spends a lot of time at the computer I've found it's worth paying extra on the 'interface' items like monitor, keyboard & trackpad (and desk & chair!). Secondly it functioned as a 'hub' - there's just two connections to the laptop (power & monitor connector) while all the extra cables (network, USB, audio, etc.) remain plugged into the screen so that when I take the laptop with me there's not a mass of plugs to take out. 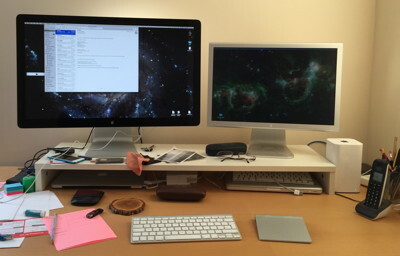 This means I can tidy most of the cables away which gives me a nice, clean & tidy desk space to work on. The laptop can drive both monitors so I have a wide virtual 'desktop' when I'm working on my own stuff but can use them separately when I have my work laptop at home too. A further improvement in the office came when I bought a wi-fi extension unit so I could stream music from the computer to the hi-fi on the other side of the room. This, along with the improved speakers in the new monitor (another nice feature, it has a camera for skype calls too), meant I could get rid of the external speakers that I used to have and not need to use an old iPod to get music to the hi-fi. I really like adding one new thing to replace several old ones, for the reduction in clutter on all sorts of levels. The office is now very nicely set up for working and getting better as a guest room but it's still a bit sparse for anything else. I plan to get the hi-fi up onto a shelf, add other shelving and put in a sofa or some other comfy seating. With the garden just outside this feels like I room I'll be spending more time in during the warmer months and it would be nice to make it cosy. One side of the flood prevention system. The builders continued their work although with a definite tapering off through the week - on Friday there were none to be found. The biggest success in my house was getting the painting done - the mismatched colour was tracked down to using the wrong finish and the replacement paint blended in invisibly. They promised to leave the left over paint so I could do my own touching up in future (or at least get someone to do it for me) but this has gone the way of the last lot, hopefully I'll at least be able to get the correct description should I need to get some more. But, credit where it's due, the paintwork now looks good. There was an odd situation where it was discovered that the bannister rail hadn't been painted on the wall side, Angelo pressed me to accept it as it was because it was out of sight and despite my not agreeing to this it's been left unpainted. It remains on the snagging list. After rejecting the various window locks that were suggested I ended up buying some myself which were then fitted by the builders. There are times when it doesn't feel like the builders have worked on residential properties before, which is strange. Things like having the fuse box in the middle of the living room, non-matching handles & fittings, radiators with bright, blinking lights on them and so on. It would be fascinating to know what deals & arrangements were made around the development but I suspect I (& the other residents) never will. 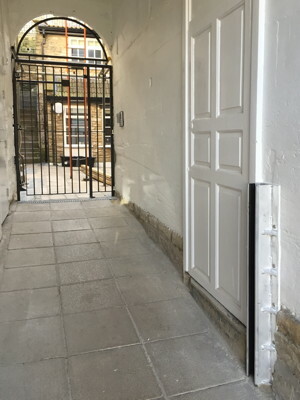 Outside of the house we now have a flood prevention system - two sturdy slots either side of the gateway into which metal 'boards' can be, er, slotted to keep the rising Avon at bay, similar to ones fitted in other buildings in low-lying Bradford. The river's not renown for flash floods so we should be able to erect our defences in good time, assuming they've not been lost in the far corners of the bin area by then. Time to elect our own Flood Control Officer maybe? I've hit an unexpected setback in my plan to add some extra units in the kitchen. Having decided to not use the development builders (for reasons that should be obvious to readers of this blog) I set out to find someone else to do the work. My first step was to return to the company who did the initial kitchen layout but I didn't get any replies to my emails, either from the designer or the general enquiries address. Next step was to use the kitchen company's 'find a local builder' website but once again there was no response to my enquiries. The new units need to match the existing ones so I'm stuck with the suppliers of that range but it seems like despite waving my wallet around nobody wants to do the work. The building trade remains a mystery to me. One thing I was able to get done in the kitchen was to add a splashback behind the hob. After going through a huge number of choices & options I decided on a glass plate with a grey backing which was a surprise to me - I was intending to have something with some colour but none of the ones I tried really looked right. The grey fitted very harmoniously with the units and the glass gave some interesting soft depth in its reflections. 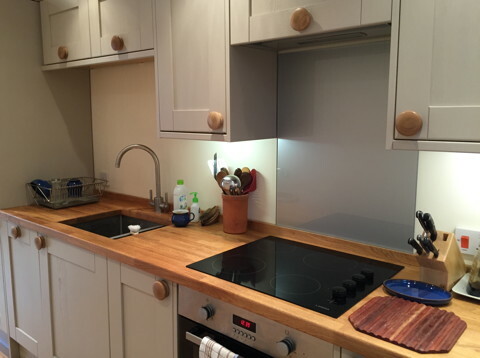 I went to a local kitchen design company (actually in Bradford, about two minutes walk away) who provided a wonderful contrast to my headaches with the builders. They were engaging, came up with all sorts of ideas & options, kept me in touch with every step of the process, and even waved at me when I walked past the shop. Suffice to say I know who I'll be using (& recommending) in future! While all of this was going on work finally began on my garden, something that had been promised for 'before Christmas'. After lots of discussion with the developer, the builders and, eventually, the landscape gardening company who the work was subcontracted out to, I'd gone for decking over the whole area. There were lots of reasons for going this way but among the main ones were the poor location - north facing, overshadowed on all sides, very damp, rubble-filled soil - and my feeble gardening skills. Plants in pots were more my style. The final design had two levels to fit over the incline of the underlying surface, this was made up of all sorts of residual detritus and was deemed to be too much work to level off. An unexpected benefit would be an improved view over the town from the raised section at the far end. There would need to be steps between the levels but we'd decide on them as the work progressed. As with so many projects not much seemed to be happening at first and then suddenly it was proceeding in leaps & bounds. There was lots of banging & sawing as the underlying supports were put in place and a framework appeared over the rough ground, then as the actual decking began to be sized up some questions came up. I'd decided to get rid of the old shrubs that had been lining the garden but at some point during the building process a small retaining wall had been put up around the base of the one nearest the house, a substantial enough structure that removing it would be hard work and decking over it would be impractical. After several days of headscratching and mentally trying out various solutions I decided to keep it as a small area for planting - a real garden! - although the shrub was still to be removed. The completed decking with the unplanned growing corner. The view over Bradford and the modernist face of the house. Getting rid of the shrubs would make the division between my garden and my neighbour's - a Buddhist centre - very open. On their side the ground was about a metre and a half higher than mine and I thought that a line of smaller shrubs in their garden would be more decorative & easier to maintain. There didn't seem to be anyone in when I went round to talk about it so I wrote them a letter suggesting the smaller plants and offering to contribute to their purchase and do some of the gardening work. So far I've had no reply and have never found anyone in when I popped round but hopefully this could be the start of a connection with them. The work proceeded quickly & smoothly and by the end of the week it was all done. And what a transformation! I'd gotten used to the patch of bare, rough earth out the back and had stopped noticing it, now I had a big open space and walls no longer hidden behind shrubbery and old building rubbish. The walls were the biggest revelation, uneven and higgledy-piggledy in their construction, obviously changed & patched up at different times and in different styles, ivy-clad at the top and sprouting small clumps of greenery here & there - they were wonderful! The yellow wood of the decking toned in wonderfully and the offset layout of the steps made the most of the available space. It wasn't all good news - the removed shrubs revealed piles of old building materials in the next garden - but this was far outweighed by my wonderful new space. Going to the far end revealed more surprises. The elevated position opened up views across the town, especially of the scenic rows of houses climbing up the hill to the Cotswolds, and promised a sheltered spot to enjoy warmer days. But the house itself provided the biggest shock - the sweet, olde-world charm of the courtyard gave no warning of the stark, modernist triangle that the south face of the house presented to the world. With its circular blobby lights and ruler-straight lines it's very bold but the aggressive contrast with the surrounding architecture doesn't feel right to me, in a different context I'd probably love it but here it's out of place. I'm not sure what I can do about it but it needs to be softened & harmonised in some way.